But the fact of the matter is that milkshakes are darn delicious, and if you have a problem with that, our bones are incredibly strong from our high calcium intake – so don’t fight us. Well we say enough is enough. No more sitting in shame while our mates enjoy hard drinks like cosmos*, we’ve had it. It’s our time to join the big kid club with MA15+ milkshakes. Please note: some of these aren’t listed on menus, you’ll have to ask for them. Not just legends for their epic burgs but also known as the milkshake masters, Miss Kay’s milkshakes are out of this world. We’re talking chocolate topped with brownies, salted caramel topped with toffee popcorn and peanut butter with Reece’s peanut butter cups – and the option to spike them all with your favourite spirits. 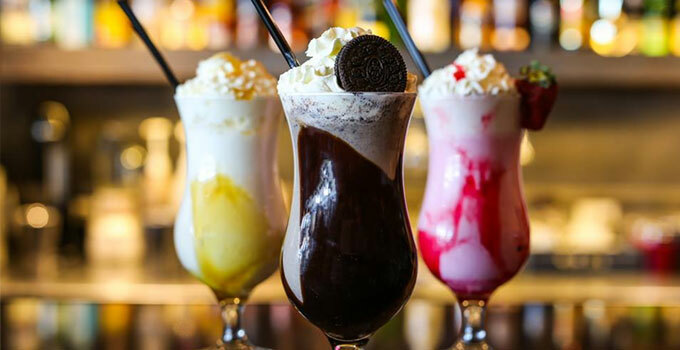 Indulge in cookies and cream with Bailey’s, lazy lamington with Malibu or strawberry story with Licor 43 at Lord of the Wings’ with their risqué adult shakes – but no one will be the wiser. Enjoy fries with a side of spiked goodness at Fritzenberger, where their concoctions have us shaken. You’ll be smashing down the classics like decadent chocolate and vanilla, or if you’re feeling adventurous, try their vanilla malt candied bacon or choc malt almond brittle fritzenshakes. This vintage diner has stolen our hearts with the option to add a shot of vodka, kahlua or bourbon to any milkshakes or thickshakes on the menu. With 12 options it’s near impossible to choose, but our faves would have to be either the toasted marshmallow or Tim Tam. All the classics and more, amongst the vast selection of cocktails at Greaser Bar you’ll find milkshakes with spirit. Literally. The thickshakes of 5 Boroughs are a sight to behold, with optional liquor just pushing them over the line to insanity (in the best way). Think choc peanut butter with Butterscotch Schnapps, salted caramel with Makers Mark and strawberries and cream with Baileys Irish Cream. Look ma, we’re all grown up. - the gourmand who can't handle anything stronger than cruisers.